U.S. Battery Mfg. 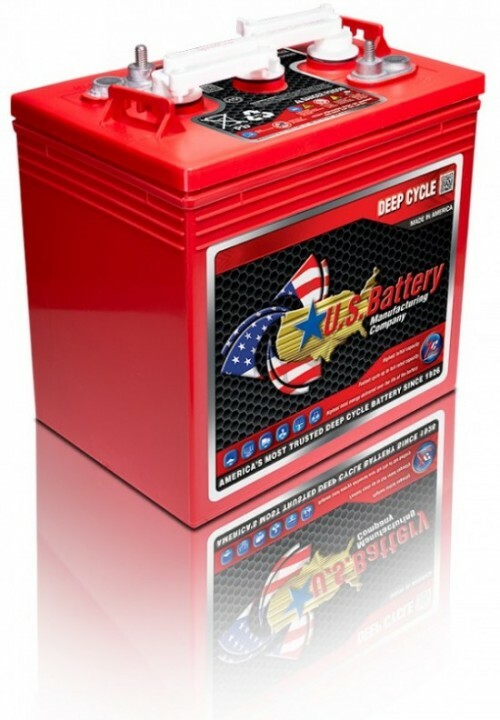 is the industry leader in manufacturing deep cycle batteries specifically for: solar power, renewable energy, wind power, energy storage, golf car batteries, marine & RV batteries, scissor lift batteries, sweeper batteries, scrubber batteries, automotive, flooded battery, agm, sealed batteries, and most other uses for deep cycle batteries. U.S. Battery Mfg. has been building flooded lead acid batteries since 1926, and has always put quality before quantity since the day our first battery rolled off the assembly line. Rugged Construction: Made with a tough polyproplyene exterior case, heavy-duty connector lugs, and nylon handles, Renewable Energy Batteries can take the rigors of use in a multitude of alternative energy storage uses. SpeedCap® Venting Positive Locking System: U.S. Battery makes it easy to conduct maintenance with a removable vent system that’s easy to operate and locks in place. Optional single point watering systems and our exclusive Sense Smart Electrolyte Valve that indicates if the battery(s) need watering are also available. International Energy Sales, Inc. is a manufacturer’s representative for leading companies in the Renewable Energy, Electric Vehicle and Energy Storage space.